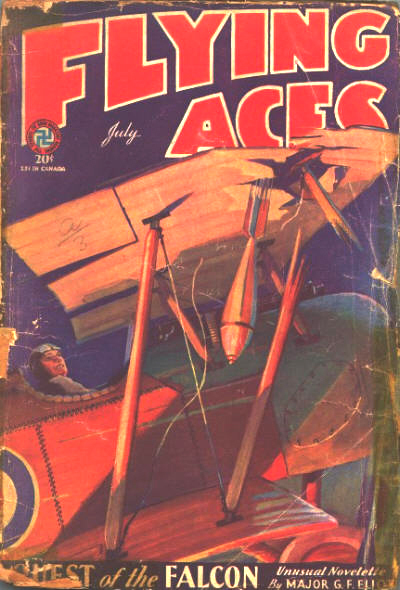 From May 1932 through March 1936, Flying Aces ran a pictorial feature illustrated by Eugene Frandzen on the ” Each month they featured a different ace from The Great War—telling his story. Very similar to Alden McWilliams’ “They Had What It Takes” which would run in the magazine after LOTAIP had run it’s course. 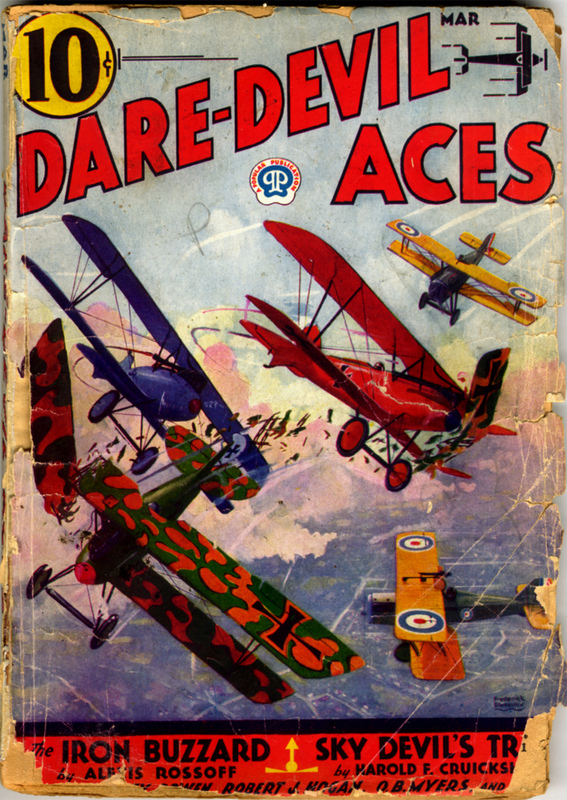 When Flying Aces was a traditional pulp magazine size of 7×10″, it was a two page feature, but when they changed formats and went with a bedsheet size, the feature became one page. 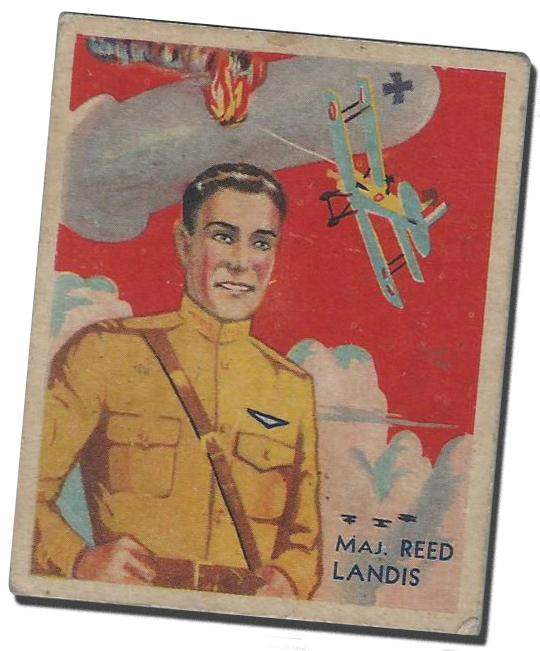 This week we have the twenty-second installment featuring the American aviation Ace, Major Reed Gresham Landis! Landis was flying with the RFC when he scored his dozen victories, all from an S.E.5. 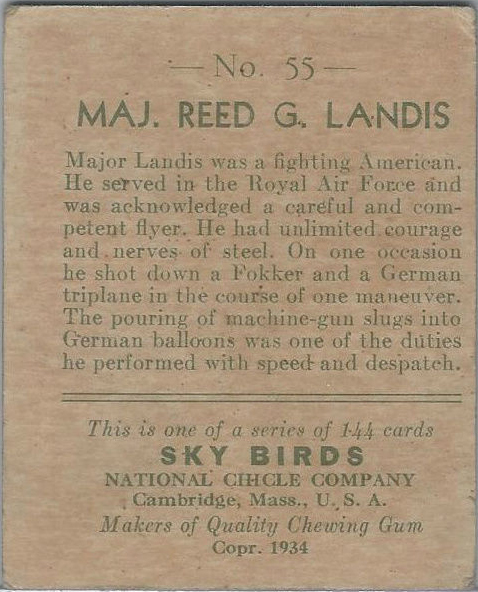 Landis was awarded the British Distinguished Flying Cross and the American Distinguished Service Cross. He would survive the war and go on to become chairman of the American Legion during the 1920’s, but returned to service in 1942 where he rose to the rank of colonel—stationed in Washington, D.C. He passed away May 30th, 1975, aged 78 near Hot Springs, Arkansas. THE EXPRESSION, “ignorance is bliss,” is well illustrated in this incident. A patrol of S.E.5’s took off for the purpose of giving a new member his first glimpse of the lines. They spotted three Albatrosses scudding along beneath them, so signaling the new member to streak for home, they dove. The new member however, did not see the signal and a moment later realized with a start that he was alone. He dove and coming comparatively close to the ground, took his leisurely way home, enjoying the country as he went. While he was thus employed a grim tragedy enacted itself close above him, and although he was the cause of it, he was in complete ignorance that an enemy ship was within miles of him. The whole thing was an excellent example of air-blindness, experienced by new pilots. It took a great deal of talk and corroboration to convince the new pilot that death had been so close to him. When the S.E.5’s dove, the Germans spotted them and there began a game of hide and seek among the clouds. At first the British chased the Germans, but when the Germans turned on them they sped away into a cloud. This kept up for some time before the Bodies speeding in V formation out of a cloud, crossed the path of the lone new member, apparently not seeing it until they had passed. Then the tragedy occured. The Boche leader made a sudden turn toward the S.E.—but the German flying on his left evidently did not notice him and started a wider turn on his own account. He tipped up just as his leader flashed by and the wings hit and sheared away. 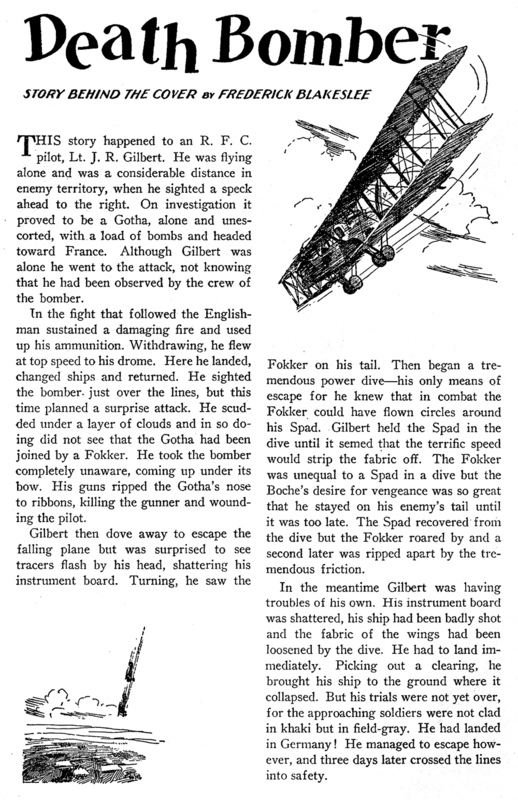 Both planes began the swift plunge to destruction, while the third Jerry, turning with the leader, went right through the path of flying debris which smashed his propellor, causing him to land, when he was taken prisoner. The above drawing, at the moment of impact, shows how it was done. The scene on the cover is a split second later. The Sky Devil is back! Harold F. Cruickshank’s hero of the hell skies over the Western front returns to action once again in another WWII adventure. 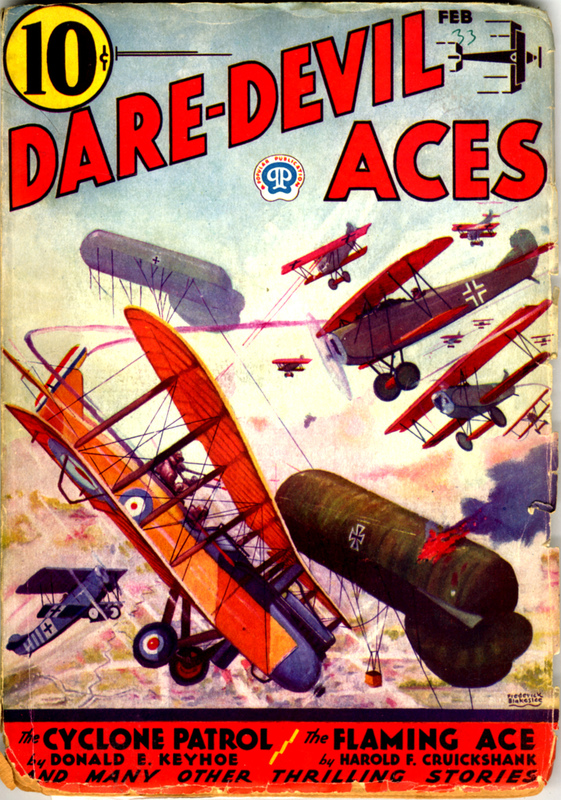 Bill Dawe had to change his name and lie about his age to join the RAF’s fight against Hitler’s Luftwaffe. 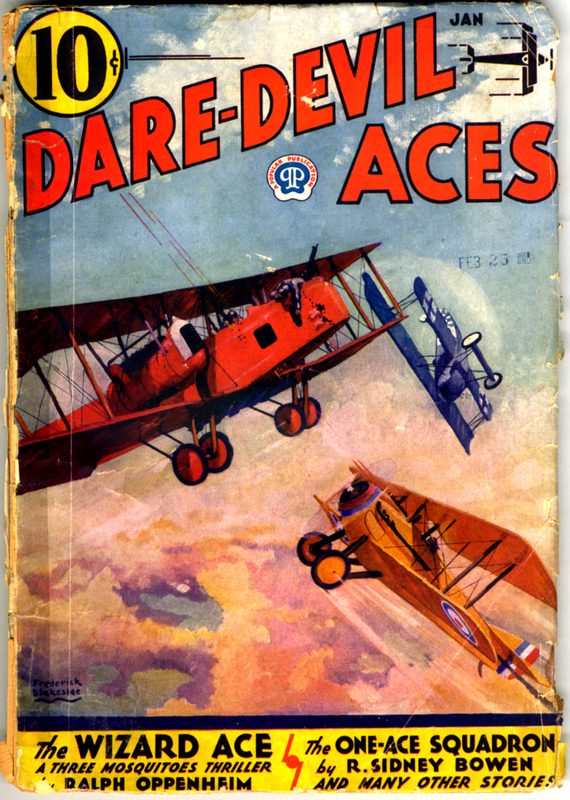 Restricted from fighting, The Sky Devil trains a new generation of eager aces, including his own son until the 77th is suddenly and brutally attacked! 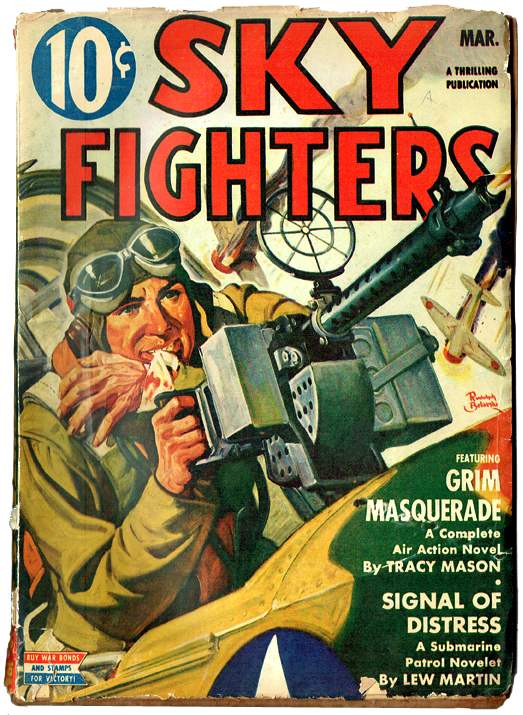 This is the second of four WWII Sky Devil stories from Harold F. Cruickshank. Years drop from a natural born fighter pilot, and “no combat” rules are forgottenf as he sheds his role of instructor to zoom through war-torn skies on a self-appointed mission of revenge! 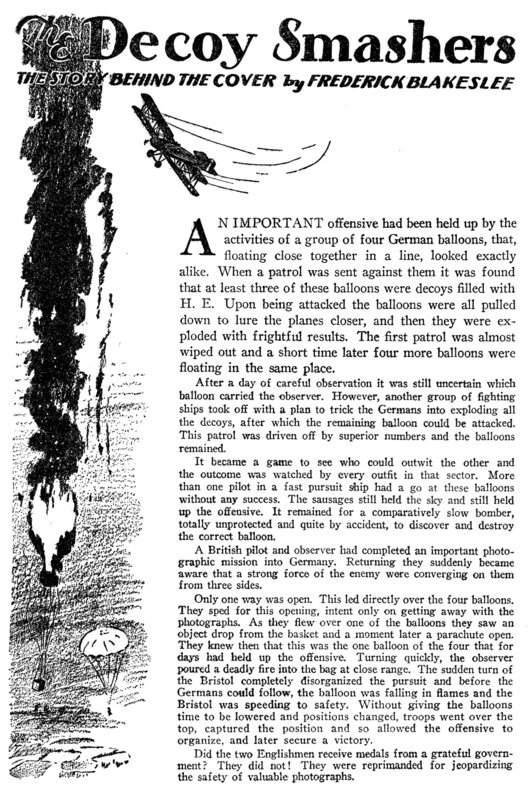 AN IMPORTANT offensive had been held up by the activities of a group of four German balloons, that, floating close together in a line, looked exactly alike. When a patrol was sent against them it was found that at least three of these balloons were decoys filled with H.E. Upon being attacked the balloons were all pulled down to lure the planes closer, and then they were exploded with frightful results. The first patrol was almost wiped out and a short time later four more balloons were floating in the same place. After a day of careful observation it was still uncertain which balloon carried the observer. However, another group of fighting ships took off with a plan to trick the Germans into exploding all the decoys, after which the remaining balloon could be attacked. This patrol was driven off by superior numbers and the balloons remained. It became a game to see who could outwit the other and the outcome was watched by every outfit in that sector. More than one pilot in a fast pursuit ship had a go at these balloons without any success. The sausages still held the sky and still held up the offensive. It remained for a comparatively slow bomber, totally unprotected and quite by accident, to discover and destroy the correct balloon. A British pilot and observer had completed an important photographic mission into Germany. Returning they suddenly became aware that a strong force of the enemy were converging on them from three sides. Only one way was open. This led directly over the four balloons. They sped for this opening, intent only on getting away with the photographs. As they flew over one of the balloons they saw an object drop from the basket and a moment later a parachute open. They knew then that this was the one balloon of the four that for days had held up the offensive. Turning quickly, the observer poured a deadly fire into the bag at close range. The sudden turn of the Bristol completely disorganized the pursuit and before the Germans could follow, the balloon was falling in flames and the Bristol was speeding to safety. Without giving the balloons time to be lowered and positions changed, troops went over the top, captured the position and so allowed the offensive to organize, and later secure a victory. Did the two Englishmen receive medals from a grateful government? They did not! They were reprimanded for jeopardizing the safety of valuable photographs. 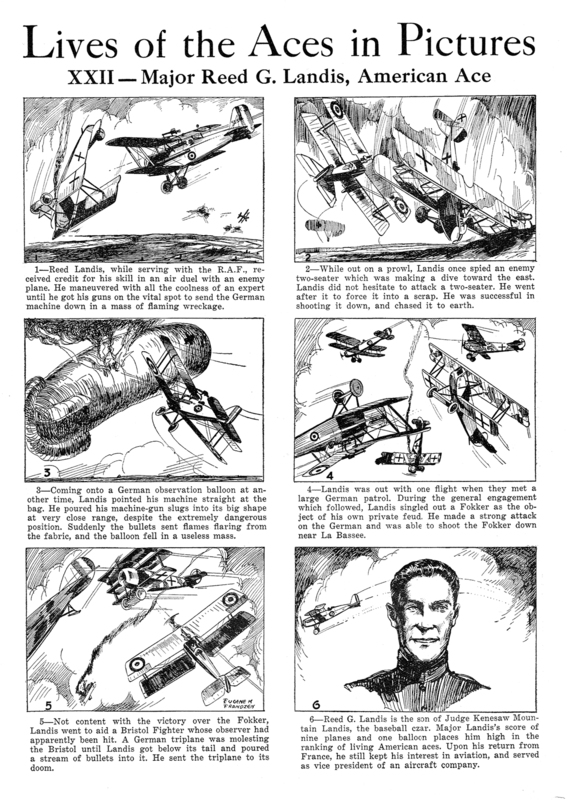 We have arrived at the final installment of Alden McWilliam’s illustrated biographies he did for Flying Aces Magazine—They Had What It Takes. For this last article he features world famous navigator Captain Lewis Alonzo “Lon” Yancey. Yancey became interested in aviation and the science of navigation while in the Coast Guard after a stint in the Navy. He quickly became a sought after navigator making his first trans-continental flight as a co-pilot in 1927. 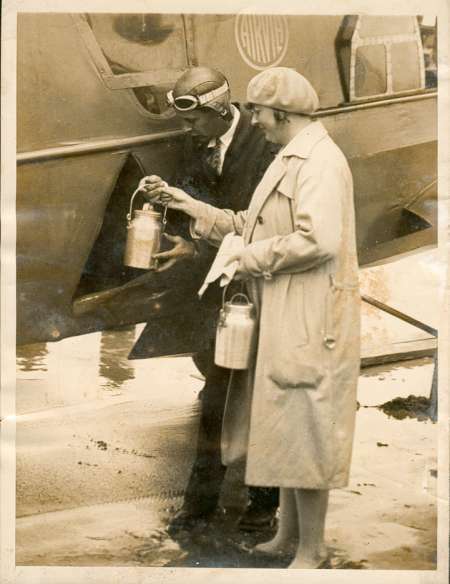 In 1929 he and Roger Q. Williams flew from Old Orchard Beach, Maine to Rome (in the picture at left, Yancey is loading provisions on his plane while German aviatrix, Thea Rasche looks on); and the first flight from New York to Bermuda in 1930. In 1938 he flew to New Guinea with Richard Archbold for the American Museum of Natural History. He unfortunately died suddenly of a cerebral hemorrhage at the age of 44 in 1940. 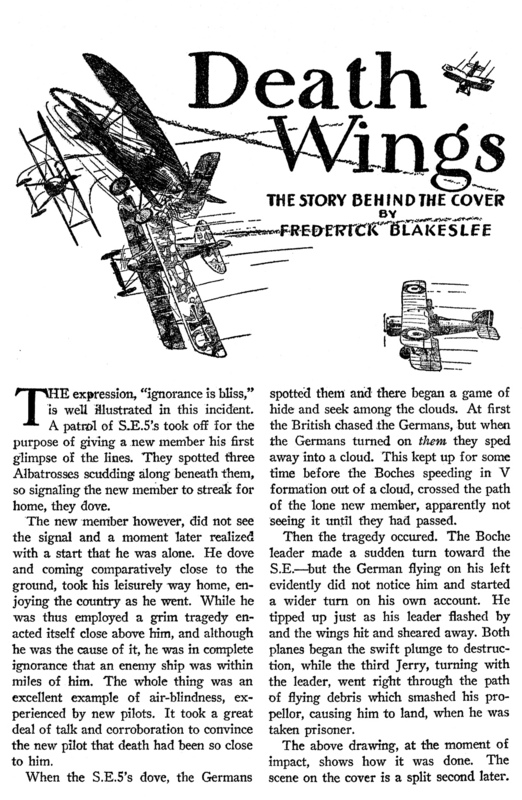 Here we are with the penultimate installment of Alden McWilliam’s illustrated biographies he did for Flying Aces Magazine. 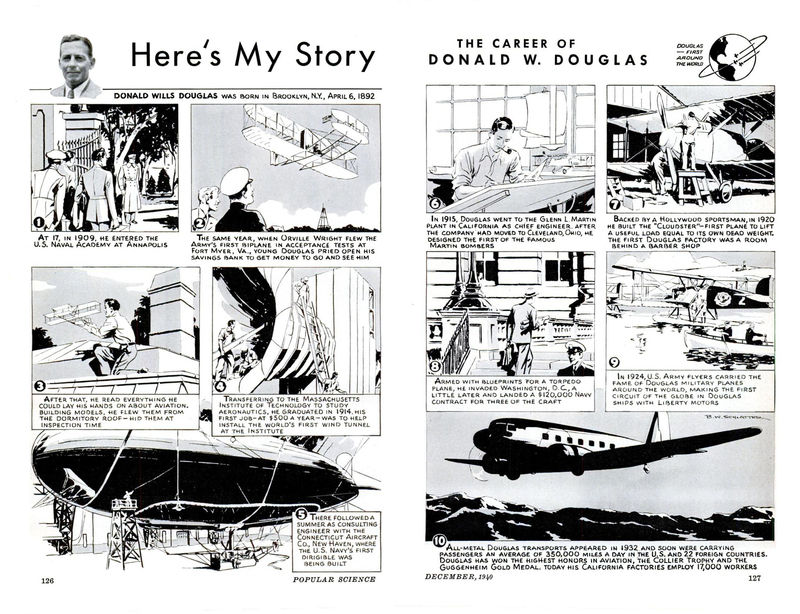 And this time around we have that giant of American Aviation—Donald Wills Douglas! 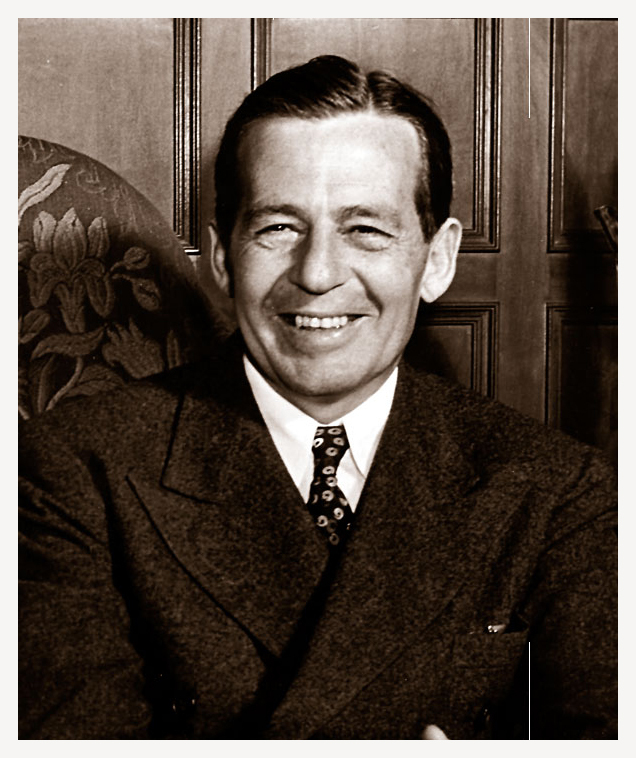 Douglas was an influential American aircraft industrialist and engineer who founded his Douglas Aircraft Company in 1921 which would become one of the leaders in the commercial aircraft industry. He went head to head with arch-rival Boeing gaining the early advantage throughout production during WWII, but then sadly fell behind with the advent of the jet age. Douglas retired in 1957 and passed away in 1981 at the age of 88. He was such a big figure in Aeronautics that Popular Science also ran an illustrated feature on his life and career in their December 1940 issue. Illustrated by B.W. Schlatter. AT THE outbreak of the War a certain German who had been educated in England answered the call of his country. In 1917 he entered the air service and the next year found him in Richthofen’s Circus. He was a clean fighter and preferred to wage combat alone where he could follow his own tactics. Once when he was engaged in a lone battle with an Englishman, his opponent’s guns jammed. Instead of pressing his advantage, the German stopped firing and waited until the jam had been cleared. The combat was started again, and again the Englishman’s guns jammed, this time hopelessly. He motioned to that effect, whereupon the German saluted and flew away. He soon became famous for his chivalry and in return was accorded the same treatment by the English and Americans with whom he came in contact. However, when he flew with the Circus, no quarter was asked or given and he fought as hard and as viciously as everyone else did. The exciting scrap shown on the cover can perhaps be best described in his own words. 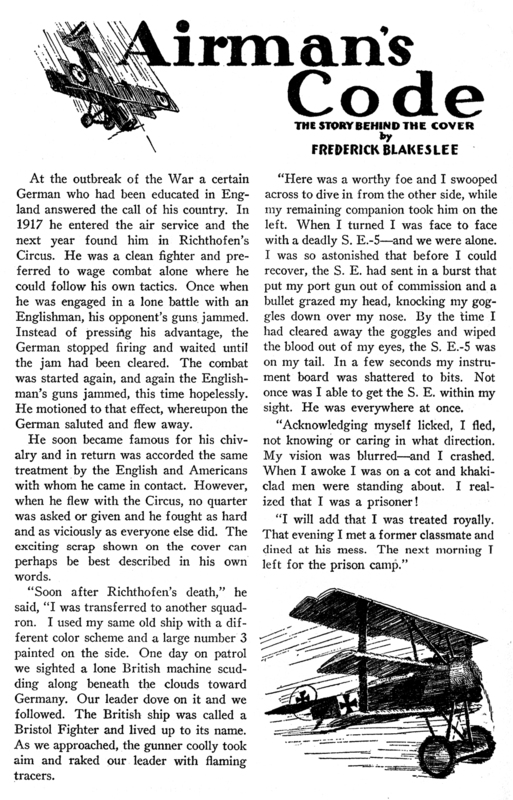 “Soon after Richthofen’s death,” he said, “I was transferred to another squadron. I used my same old ship with a different color scheme and a large number 3 painted on the side. One day on patrol we sighted a lone British machine scudding along beneath the clouds toward Germany. Our leader dove on it and we followed. The British ship was called a Bristol Fighter and lived up to its name. As we approached, the gunner coolly took aim and raked our leader with flaming tracers. “Here was a worthy foe and I swooped across to dive in from the other side, while my remaining companion took him on the left. When I turned I was face to face with a deadly S.E.-5—and we were alone. I was so astonished that before I could recover, the S.E. had sent in a burst that put my port gun out of commission and a bullet grazed my head, knocking my goggles down over my nose. By the time I had cleared away the goggles and wiped the blood out of my eyes, the S.E.-S was on my tail. In a few seconds my instrument board was shattered to bits. Not once was I able to get the S.E. within my sight. He was everywhere at once. “Acknowledging myself licked, I fled, not knowing or caring in what direction. My vision was blurred—and I crashed. When I awoke I was on a cot and khaki-clad men were standing about. I realized that I was a prisoner! 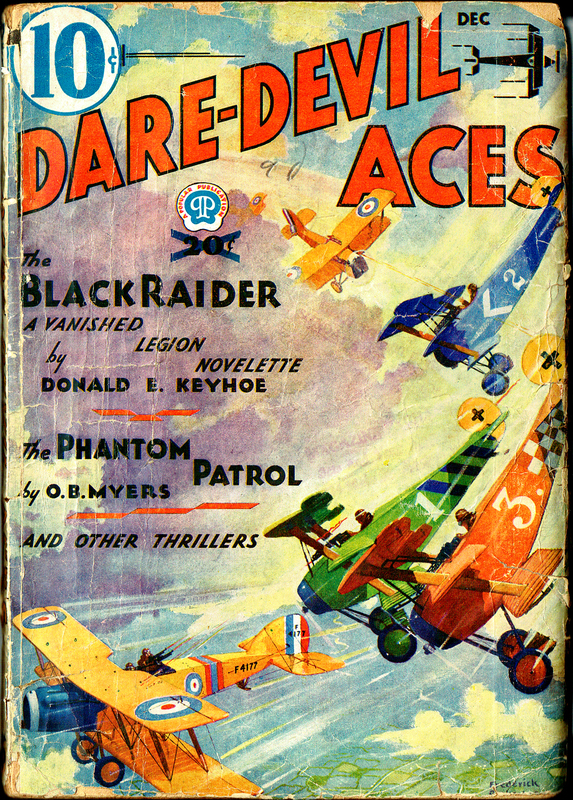 In honor of the release of Strange Operators, this time we’re featuring a novelette by Donald Keyhoe that appeared in the pages of Flying Aces the month before the first Philip Strange story. Keyhoe gives us a precursor of sorts to his Brain-Devil in Arnold Trent—a former Broadway female impersonator who took jibes and enmity from his squadron mates until at the end he flew into Germany and, posing as a countess, rescued a captured fellow pilot. Enjoy! Ahead of trent lay the 77th—and escape from the mocking fate that pursued him. But one man who knew his secret waited on the tarmac.